The Urn you see in the pictures is the one you will receive !! 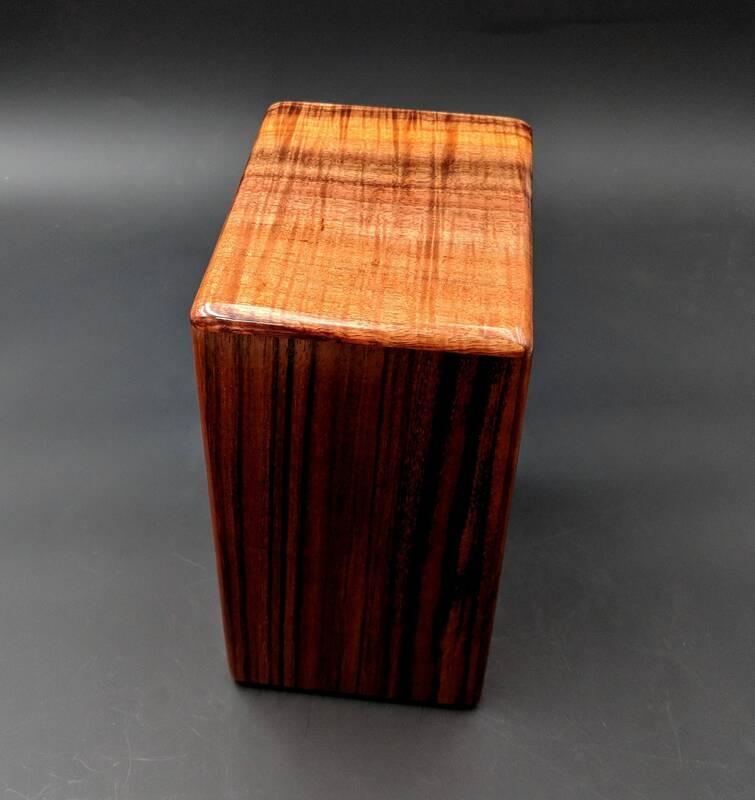 This Cremation Urn is made out of Hawaiian Curly Koa Wood that was collected from Koa trees that were blown over during high winds on the slopes of Mauna Kea on the Big Island of Hawaii. Koa (Acacia Koa) is endemic to the Hawaiian Islands and does not grow in large harvest-able groves anywhere in the world. Koa is the second most prolific endemic tree growing in the State of Hawaii and even though it is in short supply and very expensive it is not on the Endangered Species List. Harvesting of Koa trees is now limited to trees that have been knocked down by natural causes and subject to government regulations. Thousands of Koa seedlings are planted yearly now to supplement natural propagation of the species. 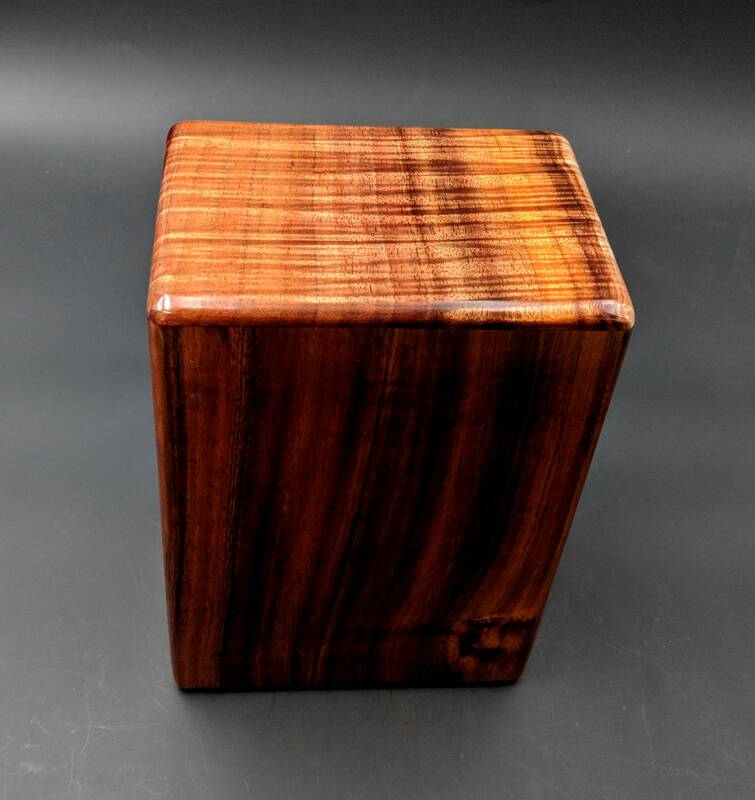 The Koa Urn for sale here is approximately seven (7) inches wide by five (5) inches deep by nine (9) inches high. 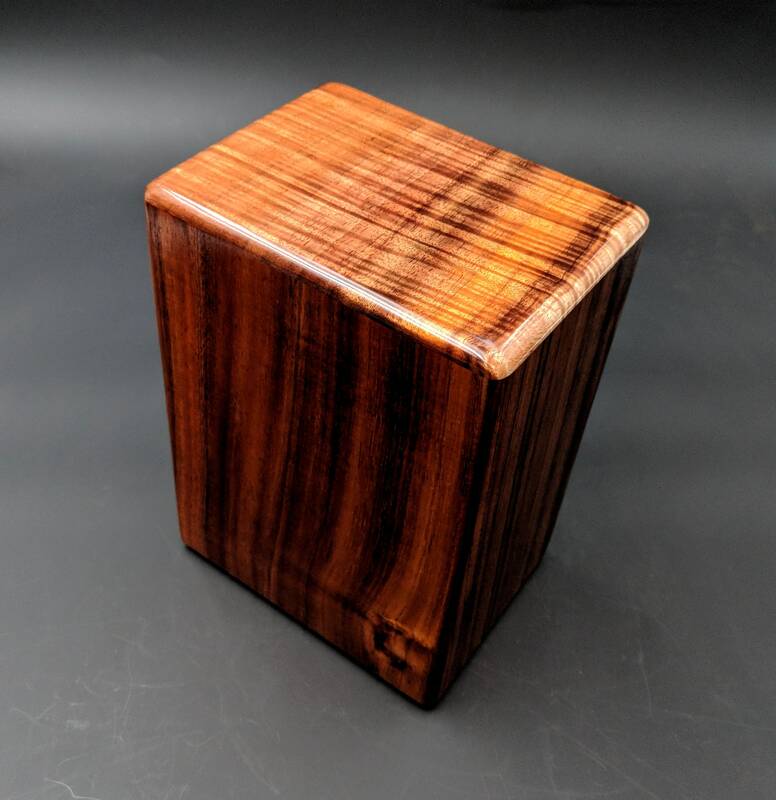 I first made the Urn this size about twenty years ago so that two of these would fit the niche at "Punchbowl Cemetery" ...The National Memorial Cemetery of the Pacific. 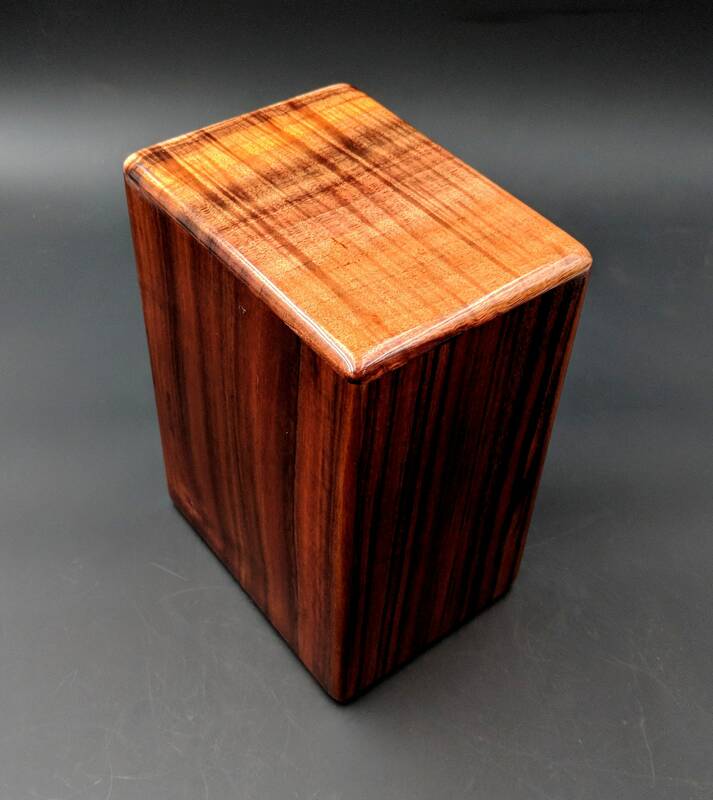 Since then the size has been accepted throughout the Hawaiian Islands and I continue to make Koa Urns of this size for burials throughout the State Of Hawaii. 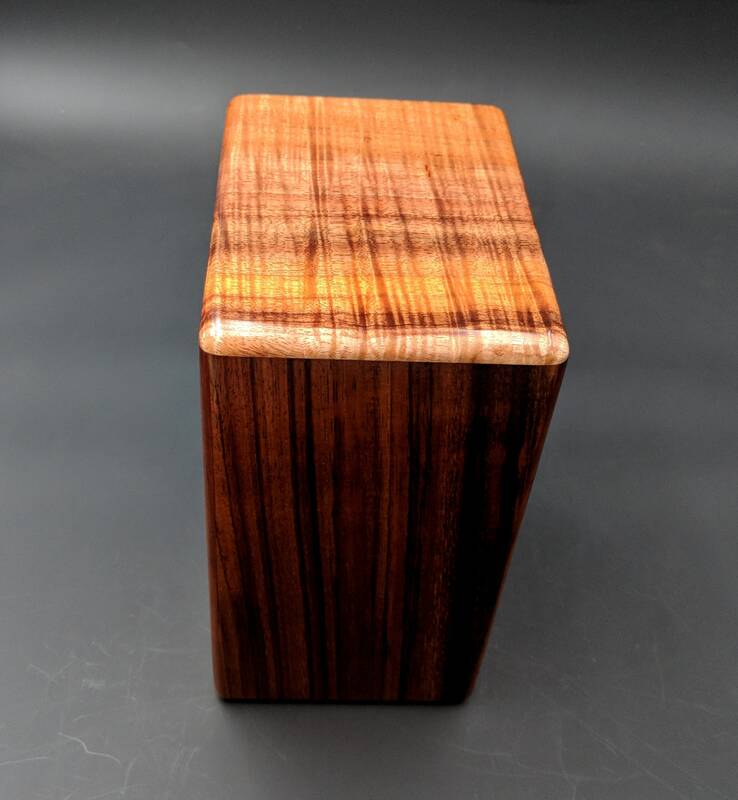 This Koa Urn is made of the finest Curly Koa and is made to hold the cremated ashes of one adult person. 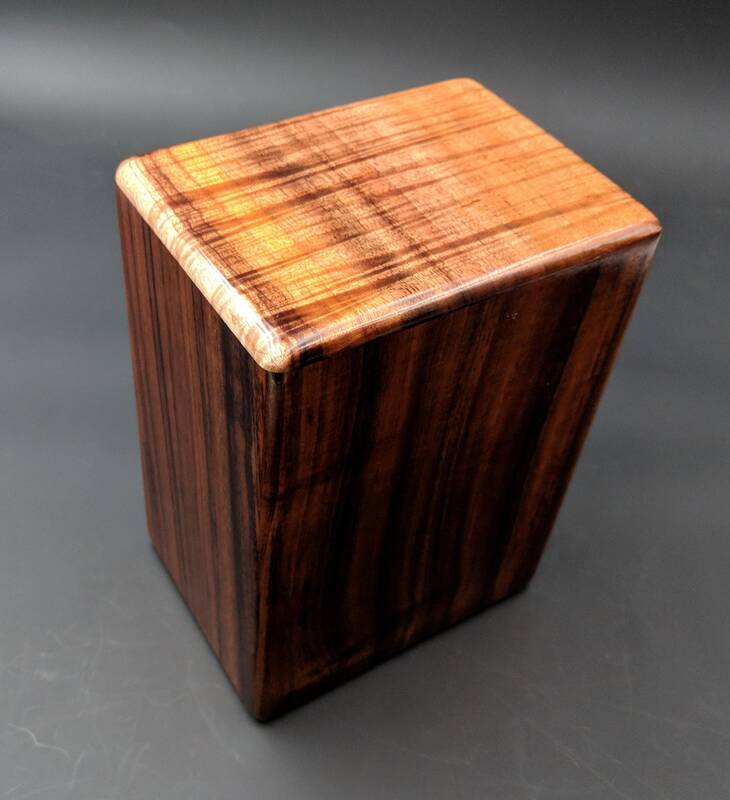 The Urn is covered with a precatalyzed semi-gloss lacquer finish. 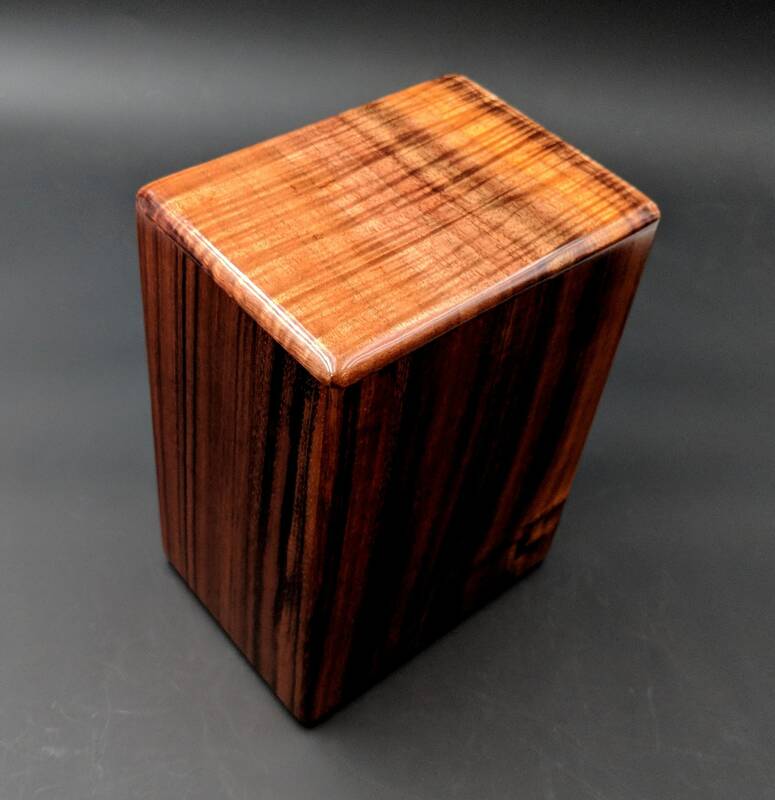 The Urn can be laser engraved directly into the wood or a brass plate can be mounted on one side. 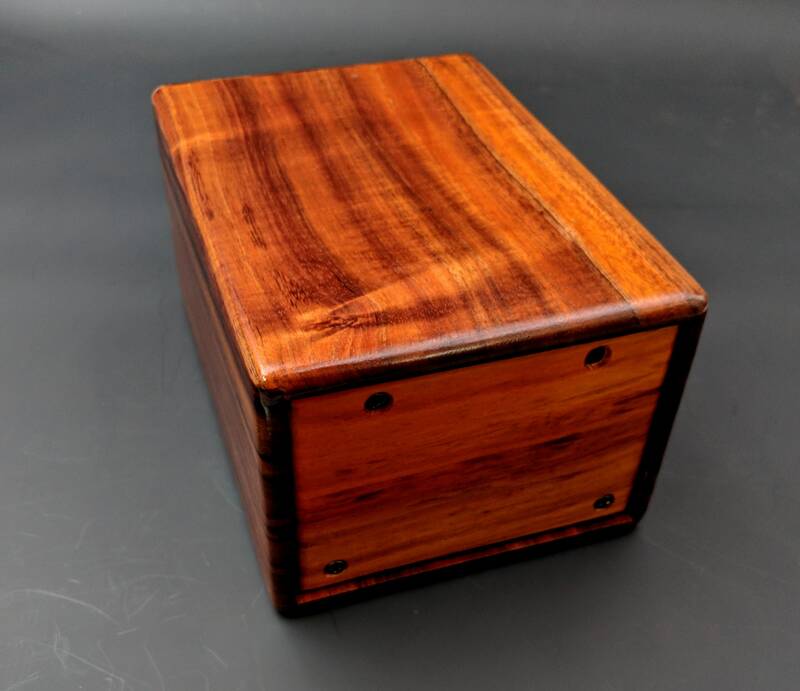 NOTE: I am not set up to do engraving myself as I don't have the equipment but if you are in Honolulu I can advise you where you can get the engraving done. Take a look at the pictures to really see the beauty of the Urn. 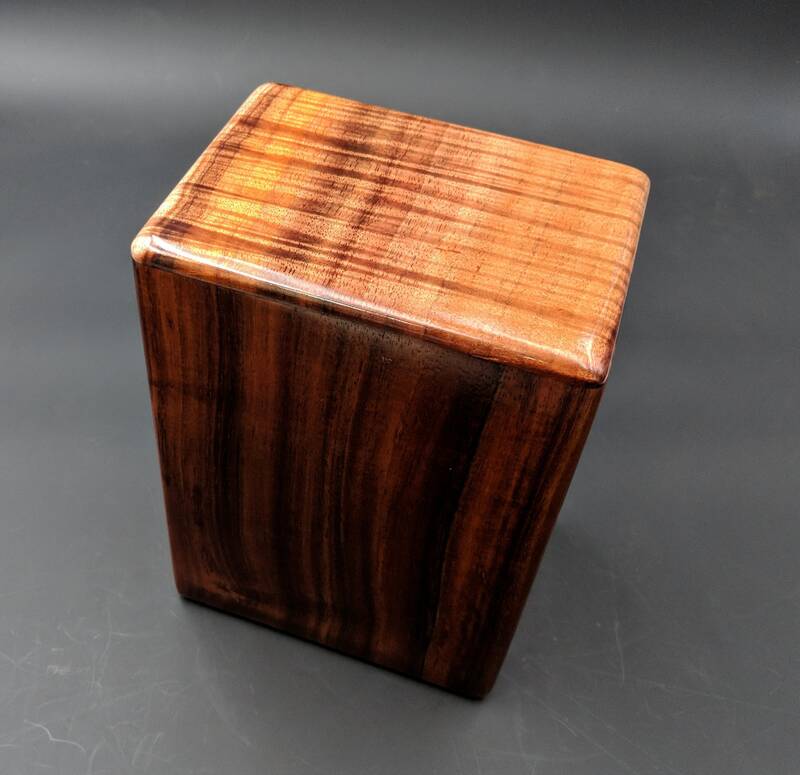 Curly Koa has a radiation to it that most wood varieties do not have. Chatoyancy is the one word that is used the most with Curly Koa. Once you have seen Koa's splendor you will know why. Customers can either place an engraved plaque on the Urn or can have the Urn laser engraved by their engraver. 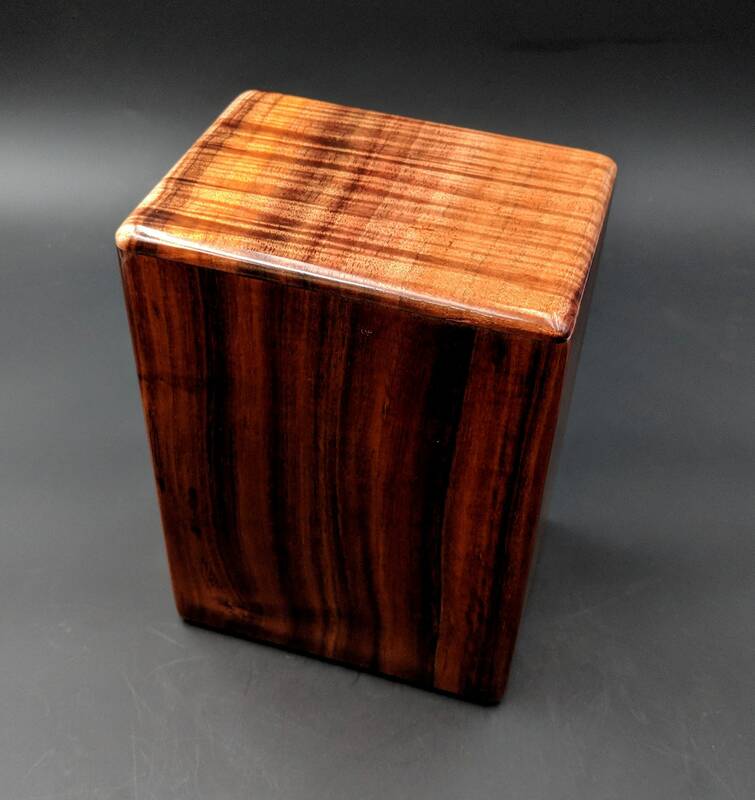 Ask any specific questions you have about this particular Urn and if you want any more pictures of certain parts of the Urn.